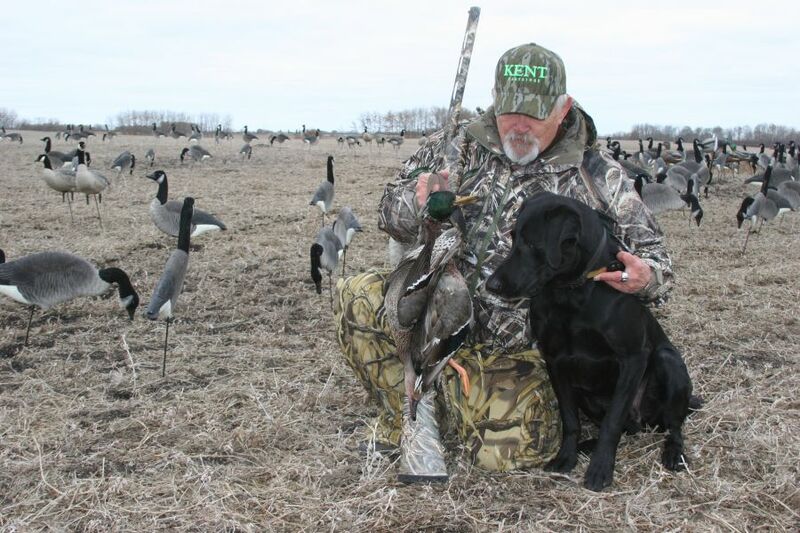 A mature pair of waterfowl hunters in the only place waterfowl hunters wish to be…Canada! The weather was mildly threatening, but the seasoned group of writers were not about to be discouraged in accomplishing their task to test some new ammo by Kent Cartridge and a new autoloader by Stoeger. 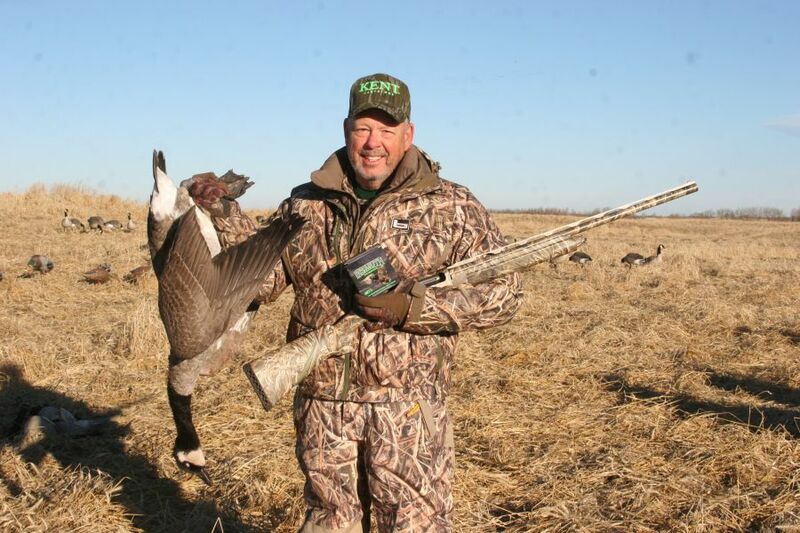 Kevin Howard, President of Howard Communications, with his fine Canada goose impressively pulled down out of the sky with the aid of the equally impressive new Kent Bismuth Loads in #4 bismuth and the new Stoeger Model 3500 autoloader 12-gauge shotgun. Very good birds taken with the new Bismuth loads manufactured by Kent Cartridge and the reliable Stoeger Model 3500 12-gauge semi-automatic. 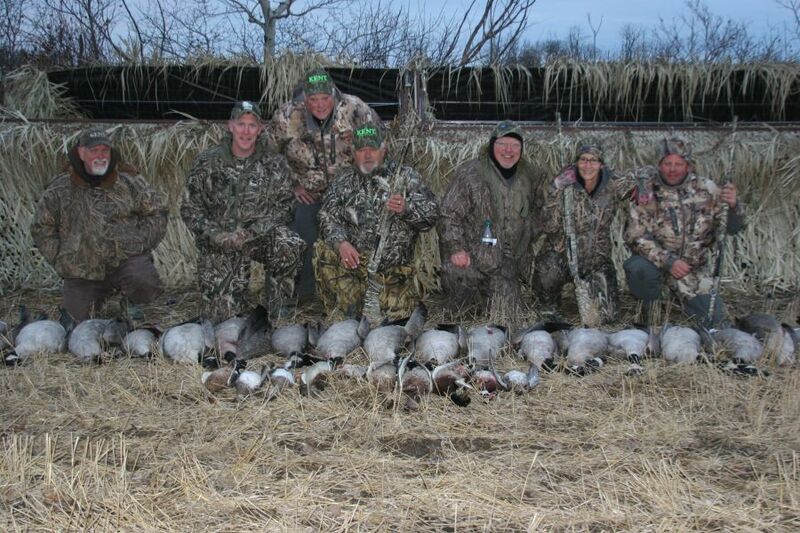 These intrepid staff writers knew right away this was not going to be just any old goose hunt. We were in Canada, where God meant geese and goose hunters to meet and get to know each other a little better. 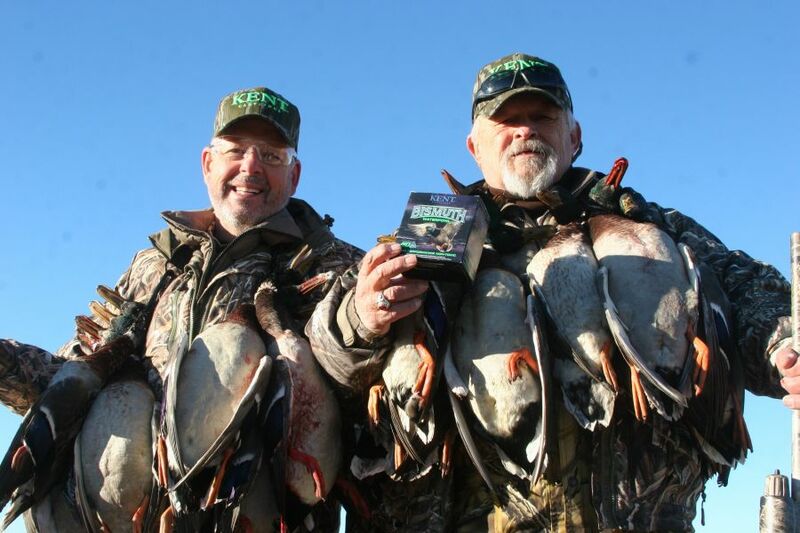 Kevin Howard and L.P. Brezny, their radiant smiles give an indication as to the wonderful time they are having hunting waterfowl. 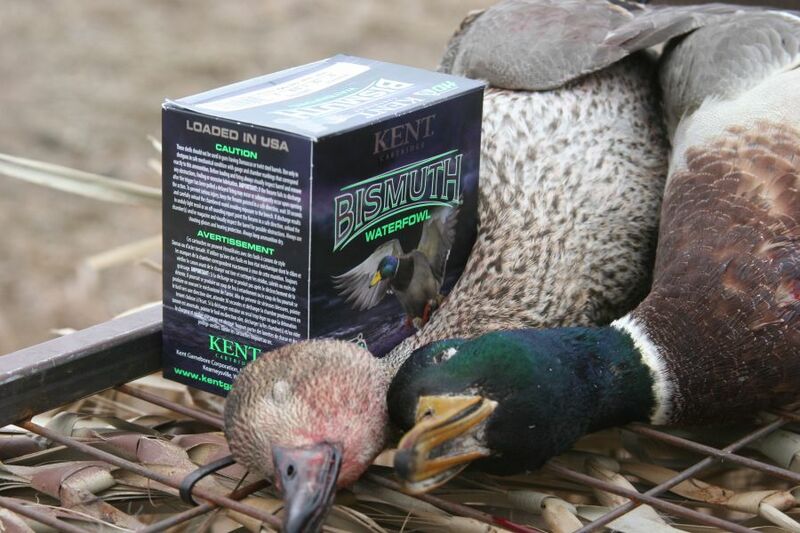 These ducks were taken humanely and quickly with the new Bismuth Waterfowl Loads by Kent Cartridge. By the time you read this, they should be on your dealers’ shelves. Great stuff! The World Class Waterfowl proving grounds for testing new shotguns and ammunition. Over the past 50 or so years, I have paid a visit to the country north of the U.S. more times than I can remember. Canada, the land of countless waterfowl has and still does make for the perfect load and gun researchers’ paradise. I do believe that was exactly the thinking of both Kent Cartridge and the folks at Stoeger shotguns when I received an e-mail from my old and trusted friend Kevin Howard, the brains and president of Howard Communications. Kevin had indicated my longtime Shotgun Sports editor, Johnny Cantu, was considering me to lead the charge in terms of learning about both a new shotgun offering by Stoeger and also a redesigned and upgraded bismuth shot load offered by Kent Cartridge Canada. Needless to say, I was on board before the words were out of Kevin’s mouth. With wheels down in Winnipeg, Manitoba, it was obvious we had flown straight into winter from an almost lingering summer down in the States. The air was cold, small water had frozen over, and the area about 170 miles northwest of Winnipeg had just been pounded by 6" of powder snow. Although not a soul was saying anything, everyone in the party of eight staff and gun writers were all thinking the very same thing: we had arrived a bit too late for this show. There was a saving grace to the event. Our hosts at Michitoba Outfitting were located on 30,000 leased acres of some of the best waterfowl production grounds I had seen in years. Yes, the small water was stone hard, but the large lake just west of the camp was stuffed full of both ducks and geese. While we would not hunt on top of the lodge itself, we did set up on the first morning within a few miles of the holding area, using pre-scouted fields that would provide good shooting if the game plan set up by our clearly capable Canadian guides was going to work. The primary reason we were in the duck and goose camp was to evaluate a brand new smoothbore design being offered up by the folks at Stoeger Arms. For those who may not know, Stoeger is a brand name linked to Beretta/Benelli shotguns. Stoeger has decided to upgrade their product line starting with their new Model 3500 inertia-driven, 12-gauge 3.5" autoloader. Engineers at Stoeger had taken a hard look at the intertia-operated shotgun and decided it needed some upgrades to make it a more dependable field tool. Built on the same pattern as the Benelli Super Black Eagle, but assembled in Turkey, the new gun was being overseen by the watchful eye of Stoeger quality control. It was hoped the new self-stuffer would get the job done. Test guns had been hammered with thousands of rounds of full-house game loads prior to their release but, as is always the case, the real dirt, blood and feathers would tell the story here. While I was sure our handler for the gun company, Keith Heinlein, the Product Manager at Stoeger, knew what he was doing, I have attended camps where every test gun present went down and had to be replaced by backup firearms brought into camp just for that reason. At first glance, the new 3500s looked like a Benelli SBE right down to the operating systems, sound when the action functioned and the familiar Benelli “bounce”. We had no time with the guns as to pattern work or even some low-flying clay birds. It was load and go, then hope for the best as such. These shotguns retained 28" barrels, camo finish in the dipped type and were starting the hunt as new out-of-the-box guns. Over the course of three hard days and several cases of ammo among eight hunters, the guns never received any special attention, to my knowledge at all. Basing my evaluation, as brief as it was, on what I was seeing out over the blind covers, my shotgun ran like a dream and never skipped a beat in terms of controls and function. There was a case involving one gun that had a loose buttstock and was replaced with a backup gun. But this was just cosmetic, and the gun was still serviceable. However, because it was not 100%, it was retired to the packing box. At two points, there were feed issues, but these were sorted out by our handler Keith Heinlein, and the problems were found to be operator error and no fault of the shotguns themselves. The test guns finished the three-day event without any sort of stoppage. Keep an eye out for these Stoeger Model 3500s if you’re checking out a new semi-auto. These are a quality working man’s field gun that will return solid results. The second reason we were here was to test the Kent Cartridge ammunition. Kent Cartridge was blowing the doors off non-toxics with brand new developments in both Kent Fasteel® and Bismuth Shot loads. Being a company with a solid reputation among waterfowlers for their steel, Bismuth and Matrix shot loads, the company felt it was time to do some upgrading to keep pace with the industry as a whole. This included the designing of new wads, shot standards, powders and even hull designs in an effort to give the hunters the very best possible loads in steel and hard-hitting Bismuth shot loads in the “designer” grade product. In terms of Fasteel® ammunition, we were going to shoot loads that would not be available to the general public until 2019 at the earliest. Kent had put all their cards regarding new shotshells face-side up on the big wide and wet Canadian poker table. If these loads failed, everyone would know about it. That took some guts on the part of my old friend and hunting partner, Robert Cove, president of this wet bird-load manufacturer. In most cases, it is necessary to get patterns of loads on paper before sending up payloads of shot at warm targets. In this case, however, Stoeger had suggested we shoot Modified chokes based on their knowledge of how the test guns were performing back at the plant. Our guides concurred with that plan based on what they knew of “closing ranges” regarding both ducks and geese. When ducks and geese arrive like swarms of Minnesota swamp mosquitoes, the need to pound pellets into paper fades quickly. The first morning in the field, S. Andrew Laidley, VIP at Kent Cartridge, passed out ammunition in the order the company wanted it to be sent up on birds. First up and assigned to decoying ducks was a revised load of Kent “Bismuth Waterfowl”, consisting of a 3", 12-gauge hull packed with 1 3/8 oz. of #4 bismuth shot. The new loads made use of new propellents and refined pellets that carried a muzzle velocity of 1,450 f.p.s. Factoring that velocity in a #4 bismuth shot pellet returned a terminal velocity on a 40-yard decoying mallard of about 731 f.p.s. My research has indicated a terminal velocity with this shot size and type requires 600 f.p.s. when gaining adequate penetration against heavily feathered waterfowl. I knew even before turning loose the first round downrange, the terminal energy delivered to warm targets was going to be quite effective, to say the least. With the exception of a few birds who came in very early looking over the spread of mixed Canadas and mallards the actual morning flight got started a bit late. However, when that first wave of mallards descended on our decoys, I could hear someone down the line say “Now this is Canada”. After the first wave had passed across our blind, it was obvious that gunning fire control was going to be necessary to make this a hunt that lasted at least part of the morning. Right off, at least a full limit of eight birds hit the deck stone dead. If it were not for the fact the Kent loads and Stoeger shotguns were so effective, one could begin to consider the whole operation over-gunning the situation. In truth, I would have loved to have had a nice fast swinging 3" 20 gauge with a 1 oz. payload of #5 Kent Bismuth in my hands. At a muzzle velocity of 1,400 f.p.s., that load would have been a real winner under these tight decoying field conditions. Shooting green heads only, setting up in teams of two shooters, the party filled the 64-bird limit in very short order. Of the birds harvested there were no cripples not retrieved by one great Lab. Even at that, sailers or gliders leaving the spread were few and far between. I never believed for a minute Kent Cartridge was going to put a pile of lame ammo on the table in front of a writer group that represented a dozen publications. When it came time for the afternoon shoot, it was a totally different setup in a new field, and now the targets were Giant Canada geese. I had not sent shot at these giant birds for better than ten years. Someone had commented we were hunting giants, but rest assured those birds were lesser Canada geese. Most hunters have never seen a true giant. I make emphasis because the true giant has a deep, hooked, white cheek patch unlike any other. I have hunted giants up to 19 lbs. and a wingspan of 6.5 feet. Rochester, Minnesota, was where a pair of the once lost sub-group were actually found, and I hunted them for over 30 years at Silver Lake in Rochester, Minnesota. Giants are big, bad and hard to bring down. As such, this was going to be a good test of a totally new load Kent was offering, a load the company was keeping top secret during the months leading up to the SHOT Show 2019. This new load was a total rebuild of Kent Fasteel® ammunition. These loads made use of new propellants, cases with special plated heads, advanced wads and special very smooth-plated shot in polished iron as well. The base ballistics indicated the standard 3" magnum loaded to 1 1/8 oz. moved down range at 1,560 f.p.s. 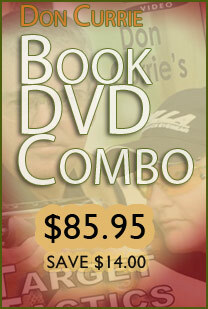 Shooting BB steel in the new package, my calculation indicated a terminal or target contact velocity of 600 f.p.s. to 60 yards. Shooting over about 150 blocks, the setup was the same as the morning duck hunt had been. However, now we had a stiff wind off our backs. That meant those big gliders, after getting pounded by the first rounds, would grab that wind and fall back in split seconds. With fire control, you allow the birds to drift feet down inside 40 yards. The first volley would be a sure thing if the guy behind the shotgun can shoot. However, the second go-around would require some long-range English applied to the shot due to the rapidly increasing distance produced by the wind agains those Piper Cub-looking wings. With the first flock decoyed numbering about 30 birds, it was obvious we owned the air space in front of our blinds. As a limit fell, it was reload, get down in our holes and wait out orders to shoot. The goose hunt was quickly closing, as the window the birds were moving in was late in the day. We were short on time. I tried to make the best use of the time left and judge my second or even third shots in terms of effective range, and bird reaction to the shot. After all, this was far better than paper, ballistics gel or guesswork on warm targets. Follow-up shots on birds hit by me or someone else in the party were informative and interesting in terms of their reaction to pellet contact. The 3" Fasteel® in its second generation load was a deadly harvesting tool. With just under 300 harvested ducks and big geese, we lost only two birds total. On the final morning of the hunt, Andrew passed out the loads of the day in the dark. With targets consisting of mallards and later geese, most of us packed both 3" BB’s in Fasteel® and #4’s in 3" 1 3/8 oz. payload packages. When the morning light was enough to identify greenheads, the duck shoot started. As usual, it was straight to one or two-man fire control. At that point, someone noticed our shotshells were different. In the dark we had been handed the 2 3/4" 1¼ oz. Bismuth shot loads in error. Andrew had held these back as filler loads in the event we had run low on 3" rounds. It would seem as though Kevin Howard, my next door neighbor, did not hear the comment as about then a medium-size lesser Canada rolled in from behind us crossing about 30 degrees off center and about 50 yards high with wings cupped for a turn to the decoys. Kevin made a snap shot at the goose and nailed him someplace in the front half of the torso. The bird folded stone dead. I thought he had hit him in the neck or head. Not so, it had been a lung/heart shot, and penetration of the Kent Bismuth had been ultra effective. As I previously stated, pattern boards, chronographs and penetration gel don’t return this kind of data.